John Saunders reports: The tournament once again has a sole leader in the shape of 20-year-old Russian GM Vladislav Artemiev, who defeated Hikaru Nakamura on the top board in round seven, played on 28 January at the Caleta Hotel. 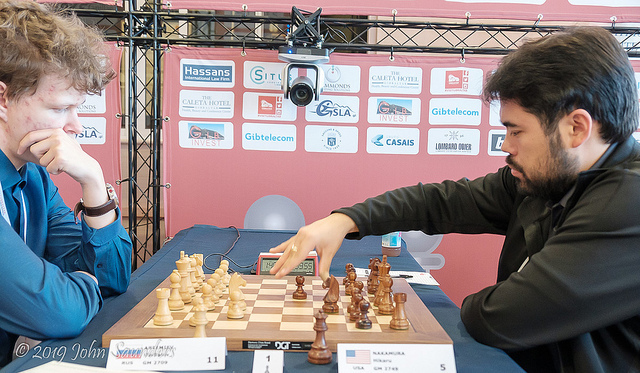 This was Nakamura’s first classical chess loss at the tournament in ten years and makes it unlikely, though not impossible, that the American will add to his record tally of four Gibraltar titles this year. Leading scores are Artemiev 6/7, followed by twelve players on 5½ – in descending rating order, Maxime Vachier-Lagrave, Levon Aronian, Yu Yangyi, David Navara, Arkadij Naiditsch, Nikita Vitiugov, Le Quang Liem, Maxim Matlakov, Ivan Saric, Nils Grandelius, Kirill Alekseenko and Rasmus Svane. The only players ranked in the top ten rated players of the tournament at the moment who do not appear in that score group are Wesley So and Hikaru Nakamura who are on 5, and Vassily Ivanchuk who is on 4½. The leading woman player’s score after round seven is Mariya Muzychuk’s 5, followed by her sister Anna and Ju Wenjun on 4½. Perhaps the two most remarkable names amongst the higher scorers at the moment are GM Dommaraju Gukesh, aged 12, and IM Raunak Sadhwani, aged 13, both from India, on 4½, with TPRs of 2650 and 2543 respectively. Artemiev’s success in downing Nakamura sent shock waves around the Rock. The game wasn’t too complicated until Nakamura launched a tactic to win a pawn but which left his kingside horribly exposed. Artemiev’s play to exploit the weakness was near faultless barring a diabolical computer move which might have saved Black but which any human player could be forgiven for missing. 21...Nxe4? This tactic to win a pawn is way too risky and leaves Black’s kingside wide open. Instead maybe 21...Bd4+ 22.Kh2, although White might still have a slight edge. 22.Nxe4 Bxb2 23.Neg5! Bxf3 24.Rxf3! 24.Qxe6+? looks like a free pawn with check but after 24...Kh8 25.Nxf3 Qxf4 26.Rd7 Bg7 27.Qxb6 Nc6 Black has sufficient counterplay. It is much better to leave the pawn be and threaten to take it with the knight. 24...Bd4+ 25.Kh1 The f-pawn is immune from capture because of the exchange of rooks on f4 follow by a king and rook fork with Qe6+. There is little that Black can do to stop the threat of Nxe6 or alleviate its consequences. 25...Rce8 26.Nxe6 Pretty much anything Black does now, White can prop up the knight with f4–f5. The position is probably lost anyway but now Nakamura embarks on a suicide mission to snag a queenside pawn, making things worse. 26...Qc6 27.f5 Qxa4 28.fxg6 Rxf3 28...hxg6 29.Rxf8+ Rxf8 30.Nxf8 is hopeless. 29.gxh7+ Kh8 30.Bxf3 The wrong recapture, though the right move to exploit is an outrageous computer move which few humans could find. To be absolutely computer-proof, White would have to find 30.Qxf3!! Rxe6 31.Qf8+ Kxh7 32.Rf1! Bg7 33.Qf5+ Rg6 34.Be4 Qe8 35.Qh5+ Bh6 36.Bxg6+ Qxg6 37.Rf7+, etc, which wouldn’t have been easy in time trouble. 30...Nc6 Here the diabolical computer trick is 30...Nd3!! where the main point is 31.Rxd3 Qxc4! 32.Rxd4 Qxe2 33.Bxe2 cxd4 34.Nxd4 Re4 winning the exchange. Close to impossible to find for a human, especially when short of time. 31.Nxc5! 1‑0 A pleasant way to end the game. If 31...Rxe2 32.Nxa4 Rc2 White can either capture on c6 immediately or throw in 33.c5! winning much as he pleases. Round seven was almost as much of a bloodbath as round six, and the top-end draws were also extremely hard-fought. Ivan Saric pressed David Navara very hard on the second board but the Czech player managed to reach what for him was the safe haven of rook versus rook and bishop and drew in 87 moves. Grandelius-Le Quang was also a lengthy encounter in which the Swedish GM had all the chances that were going but couldn’t nail down his resourceful Vietnamese opponent. Baskaran Adhiban attracted a lot of the early attention in the round when he flashed out a buccaneering Bxf7+ piece sacrifice in a hybrid Four Knights/Ruy Lopez, Bird variation against Yu Yangyi. Everyone was rooting for him playing in this romantic 19th century manner and he managed to get three pawn for the piece, but Yu Yangyi calmly refuted it and the beast was duly tamed. Vachier-Lagrave-Tari was a Symmetrical English and the young Norwegian seemed to be doing OK until retreating a knight to an unfortunate square on move 15 and allowing his opponent more of an edge. Soon MVL won the exchange for a pawn and that was that. Jaime Santos Latas played down to a level rook and pawn endgame against Naiditsch and one would have expected a draw but for the Spaniard locating his king on the wrong square on move 58, if Stockfish 10 is to be believed. Definitely one for the endgame connoisseurs, showing how an advanced pawn can make all the difference in otherwise level endgames. 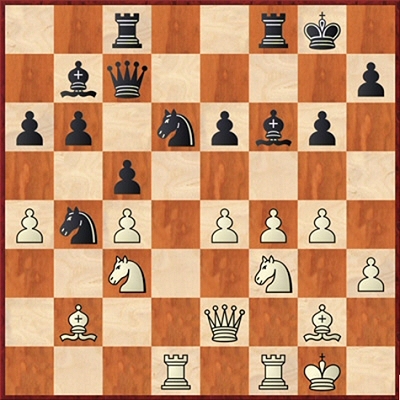 Jumabayev-Vitiugov was an English Four Knights with a new move for Black occurring on move 11. White’s reply looked like a weakening of his pawn structure. Black trained his guns on the weakness and eventually squeezed his opponent into trying a desperate exchange sacrifice which didn’t work out. Werle-Alekseenko is another game which will appeal to endgame fans. It came down to a knight and pawns endgame with the Dutch player slipping up on move 59 when he went the wrong way with his king, costing a vital tempo. David Howell has bounced back from a dodgy start by winning three games in a row against female opponents. In round eight he has a chance to win the title (bestowed by me) of ‘tournament bully’ if he adds a 12-year-old child to his list of victims. But that child is Dommaraju Gukesh so it won’t be easy. With 5 points David now shares the honour of being the leading English competitor with Mickey Adams, who drew with Lalith Babu. Mariya Muzychuk remains the leading female competitor by virtue of taking a half-point bye to reach a score of 5/7 and none of her rivals managed to make up the leeway. Sarasadat Khademalsharieh also took a time-out to reach 4½ while Anna Muzychuk achieved the same score via a draw with German IM Dennes Abel. Dommaraju Gukesh continued his ascent by beating Venezuelan GM Eduardo Iturrizaga. Gukesh now has 5 points and a TPR of 2650. On the same score is the slightly older Indian IM Raunak Sadhwani whose victim was US GM Varuzhan Akobian. Raunak’s current TPR is 2543 but he has a chance to beat his third GM in a row in round eight when he plays Daniil Yuffa of Russia. Round eight takes place on Tuesday at 15.00 local time (GMT+1).